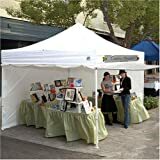 10 feet length x 10 feet width instant shelter, Sets up in seconds , Fold up 5 ft. long - fits in most trunks , Ideal for commercial or recreational use (small business, craft shows, tailgate parties, picnics, camping, outdoor sporting events) . Commercial grade DuraLast top , Provides 99% UV protection, Water resistant , New seam seal water protection , CPAI-84 fire rated top and sidewalls , Commercial grade Aluma-Steel powder coated frame , Lighter than comparable all-steel frame canopies , Anti-corrosion aluminum legs , 3-position adjustable legs , Includes name banner, awning, stakes and deluxe roller bag , 4 zippered polyester Dura-Lon sidewalls . Middle zipper access in 1 sidewall . Roll-up feature on all sidewalls . No loose parts; no tools required.